I think I handled a potentially "dangerous" situation well today. I've been craving sushi - and my son LOVES sushi and asks for it all the time. So today, I decided we could get some. I ordered take-out, so we wouldn't be tempted to get more than originally ordered. Our favorite sushi place does incredible bento boxes, so we got two, to-go. One was chicken teriyaki (sauce on the side), salmon shioyaki (no sauce, it's just grilled) and sashimi (which is just raw fish, no rice). The second was more chicken teriyaki, more sashimi and chicken katsu (fried - husband's favorite). Each box comes with a salad, miso soup, rice, and four pieces of California roll. It's a ton of food. Awesome. :) So I ate my salad (no dressing), three pieces of tuna sashimi and five pieces of salmon sashimi, and one piece of California roll. No soy sauce. I had a sip of miso but it was very salty to me so I skipped the rest. I smeared a tiny bit wasabi on each piece of fish, and I did have a couple bites of the chicken teriyaki without sauce. I saved the salmon shioyaki for dinner. Today I'm eating the oatmeal raisin cookies for the first time. They're not bad... not as good as the chocolate chip cookies, but still edible. I was out when I needed to eat one of them, but had brought it with me and ate it in the car while driving to some errands. Nice that it's portable! Oh, and today I did start off with a small protein shake (70 calories for 13 grams of protein and 1 gram of sugar) before I ate my first cookie. Not sure if it helped a lot, but right now I'm not rocking a huge headache so that's good (yesterday I did get a headache after I posted here). I'm not going to focus extensively on the numbers on the scale, but instead look at the trend. Yes, I had a nice weight loss this morning, but I'm still above where I was a week ago (before my birthday...) and Sunday night I overate at an Oscars party, so a weight loss this morning was to be expected. ;) Hopefully the scale will continue to nudge down! Ahhhh, here we go again. Weight is way up, and I'm just struggling so hard to lose the weight and finding it difficult to get into it. So, I feel like I need to do something "drastic" - and I'm going on the "cookie diet". 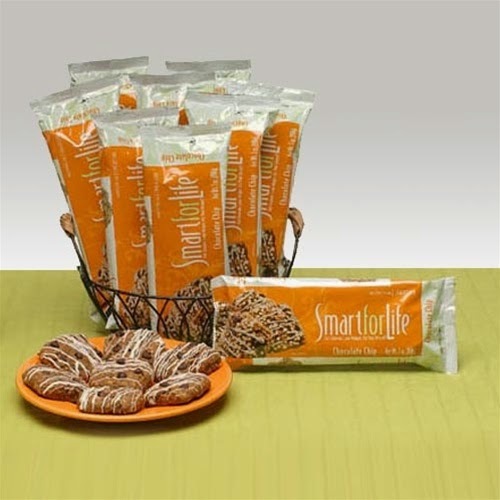 I bought a bunch of the Smart For Life cookies from Costco and today, it begins! Basically, you're supposed to eat one cookie every two hours, skipping breakfast and lunch, and then eat 10-12 ounces of lean protein and 5 cups of veggies for dinner. And drink a ton of water with each cookie. OK, so multiply that times six, and you're eating 600 calories, 12 grams of fiber and 36 grams of protein. Not enough! The diet guidelines do say that you can eat some of the 10-12 ounces of protein at lunch if you wish, so I did have 2 ounces at lunch. Should've had more. I think I also need to start off with a protein shake as well - I'm used to more protein during the day, and I think not having as much is definitely having an impact on me (hello, headache!). So I'll adjust for that tomorrow (and eat maybe 3-4 ounces of protein at lunch). I am concerned about the fiber too - the guidelines explicitly forbid beans, which is a typical great source of fiber (and protein). I usually get a bunch from fruit, and that too is forbidden because of the sugar content. I see much spinach in my future.